What was once well-known as U.S. Highway 666 is now Highway 491, a long north-south route that crosses the states of Wyoming, Utah, and Arizona. The highway’s name was changed in 1993 because of many incidents of stolen road signs linked to superstitions based in Christian associations of the number 666 with biblical prophecies of the “number of the beast,” with the “beast” being the devil. This long highway has a spur, which was also known as Highway 666, that heads to the southeast from Monticello in Utah, through western Colorado and New Mexico, down to Gallup, NM. In 2003, the name of this segment of the highway was changed to U.S. Route 491. "Gallup, NM" is licensed under Public Domain by Wikimedia Commons. 2003 U.S. 666 is gone, but signs went first. St. Petersburg Times, July 20. 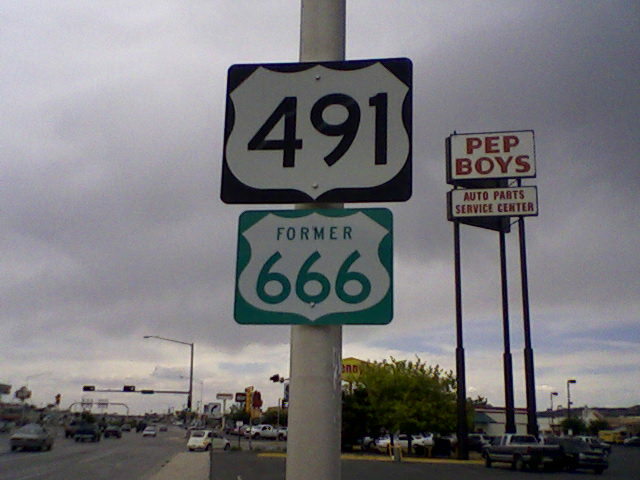 2005 The Devil's Gone on US 491.